← What’s Next With Constitutional Amendments in NC (2018)? Judge Weeks served as a judge in North Carolina for 24 years, and served as an assistant Cumberland County public defender for 10 years. Judge Weeks has presided over several cases, including the first and only challenges brought under the NC Racial Justice Act. 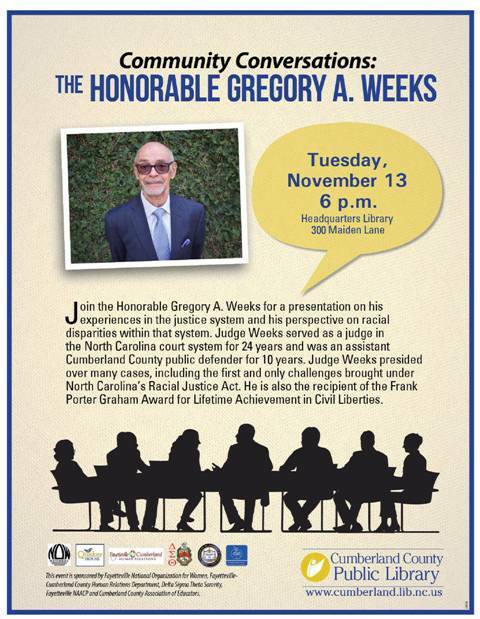 He will be sharing his experiences in the justice system and discussing his perspective on racial disparities within our system of justice. Do make arrangements to join us tomorrow evening. This is Fayetteville NOW’s final 2018 event of “Community Conversations Series,” with our coalition partners (NAACP, Cumberland County Public Library, Quaker House, Fayetteville Cumberland County Human Relations Commission, Delta Sigma Theta Sorority, and Cumberland County Association of Educators). This entry was posted in prison, racial justice, racism and tagged judicial system, racial justice, racism. Bookmark the permalink.